Holy Hump Day - Pyramid Workouts Anyone? Today I managed to get myself out of bed for another morning workout. It was easier since Jason was already getting up at 5 am for swim. Today's workout was kind of tough though. I started with the warm up from Shock Cardio HiiT Pyramid, did Pyramid Upper/Lower (sans DVD), and finished with the HIIT. Since the Pyramid Upper/Lower workout was pyramid up only (12, 10, 8), I went up with my starting weight. This was a very good decision for me as I pushed myself to near failure for most exercises. The premise of the pyramid up is that you start with the lightest weight for 12 reps, increase weight for 10 reps, heaviest weight for 8 reps. Here are the exercises I did. Lower body only had one superset, upper was all supersets with one tri-set. The biggest key for making this workout super effective, is to not allow rest time between sets. You want to have your weights set up and ready to go so you can quickly increase the weight without much rest/recover time. I'll admit that the only downfall of doing this workout without the DVD, is that it's really easy and tempting to allow rests between each weight increase! Today turned out to be another sunny and unseasonably warm day (76 degrees). I sort of regret that I did cardio in the morning, because a lunch time run would have been so great. The one thing, for me at least, about morning workouts is that by the end of the day I could almost do another workout because it often feels like my workout was done the previous day (if that makes sense). I restrained myself though. It's not like I'm training for a race and have to get in the run, and I know that I need to let my muscles recover from the weights and HIIT workouts. Sigh. For a while I was really on a roll with new recipes and creativity. It seems to be waning in a serious way all of the sudden. Now that the weather is warmer, soup isn't sounding quite as appealing. I'm going to have to find some warmer weather recipes soon, especially those that can be done on the grill. Tonight I decided to try to recreate a creamy broccoli salad, think of something you'd find in a deli case. 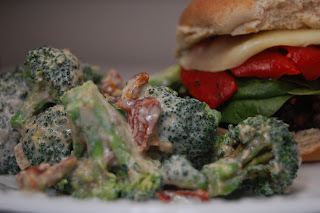 I came up with "Creamy" Broccoli and Sundried Tomato Salad. 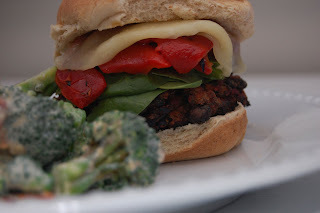 I served alongside Black Bean Beet Burgers. (optional) Steam broccoli florets for just a couple of minutes then quickly transfer to ice bath to shock. Drain and put in large bowl. In food processor or blender, combine tofu, lemon juice, vinegar, salt, and pepper. Blend until smooth. Combine tofu mixture, tomatoes and shallots with broccoli. Let refrigerate at least one hour. Ok, so I really wanted to follow up on my post yesterday that included a recipe for Averie's Peanut Butter Protein Power Bars (My Way). I wish I had the nutritional stats on these. I cut mine into 12 rectangular bars and wrapped individually to store in the freezer. Jason and I split one today at lunch. They are really tasty and filling. I love the fact that they ingredients are all natural (as long as use opt for all-natural and don't use flavored syrups, chocolate, or butterscotch chips). While I am in love with the taste, my only complaint is that they are really fairly soft, even just out of the freezer. Perhaps it was the omission of the coconut? I'm wondering if less agave might help in the even that one leaves out the coconut. Since Jason and I often run from the house or workout at home, leaving these in the freezer is not big deal. However, we won't really be able to take them with us for longer runs or if he goes on long bike rides. Could these possibly be dehydrated slightly? Thoughts, suggestions are welcome because I do plan on making these again. They are too tasty not to! This broccoli salad looks so good! Since having made tofu, I am looking for new ideas. Sooo easy! Wow! Interesting idea for the "cream" for the creamy broccoli salad. Did you like it?? I will have to try that sometimes! Kristen @ Swanky Dietitian this was super easy to mix up. On first taste I thought it was bland, but after sitting in the fridge for a while, sooo good. Hi Kristina @ Free Style Fitness Addiction ! I should have posted my taste opinions. Duh, I usually do. It was really good. The next time I think I'll use firm rather than soft silken tofu. Other than that, it was really quite tasty. Hard to mess up when you add sundried tomatoes though! that workout looks awesome! do you have all of cathe's DVD's? I love her! I would love that workout if I had space in my apt to do it haha but I could certainly do that in the gym! averies protein bars are awesome! glad u liked the nooch post! I get the same way about recipes, I have all these ideas, and then the weather or my schedule or my mood changes and I'm out of ideas in a flash! I really want to try your bars. And thank you so much for your help today! :) I appreciate it! Sounds like a great workout this morning. Your broccoli salad sounds great to me! I will run the nutritional stats on the bars for you tomorrow. If you don't get an email from me by lunch tomorrow please remind me. I love those bars!! I make them my "own way" too and eat them daily. They are so easy, healthy and wonderful! Great idea for the sauce!! Naomi I have quite the majority of her DVDs. As for the Pyramid series, I just wrote out the exercises and reps and created a workout sheet that I have indeed taken to the gym. I did the same for her Slow & Heavy and Gym Style series. Averie @ Loves Veggies and Yoga I really love broccoli too. YUM. I enjoy reading all of your posts. So many yummy new ideas! LIndsay @ Lindsay Runs no problem, glad I was able to help. I bet you get a ton of new commentors now! It's amazing how much mood can affect what you want or don't want to eat! Alyson @ Nourished Fitness my bars won't be lasting long either!! I really like doing pyramid style workouts, but they're not easy that's for sure. I read a good article about different ways to do them the other day. Going to try out a few of the various methods. Vegan Epicurean the broccoli salad was a nice change from the typical sweet potato "fries" I do with my veggie burgers. Felt very spring like. Thank you so much for running the nutritional stats. That's awesome! Hi Kris @ iheartwellness the sauce was super easy to whip up and made for a great creamy salad without the guilt. It's a keeper for sure. 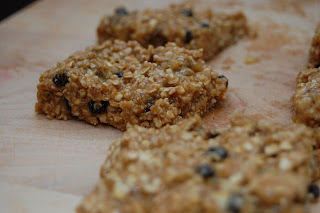 The next time I make the bars I want to do cranberry and maybe blueberries. YUM. I used to do pyramids a lot and REALLY liket hem! That dinner looks amazing!! PLEASE COME COOK FOR ME! Hey Lisa @ I'm an Okie thanks for stopping by. I haven't done pyramids in many many months so like with any new workout, ouchie! Kelly @ Healthy Living with Kelly I'll cook for you if you can run for me somehow! LOL.